When Nemanja Vidic arrived at Manchester United with a £7 million price tag and the job of filling the void left by such favourite sons of Old Trafford as Steve Bruce and Jaap Stam, there were some who doubted that the young and little-known Serb was up to the task. But when you have grown up in a war zone and seen your best friend die of a heart attack at the painfully young age of 20, then, as Vidic admits, it takes more than the words of a few doubters to put you off. 'I appreciate life a little bit more than some people,' he said last week. Vidic, now 27 and a rock at the heart of United's defence, was a young boy and growing up in the industrial city of Uzice, in western Serbia, when his country was plunged into conflict over Kosovo. His home town was targeted by Nato bombers and its citizens reacted, famously, by taking to the streets in open protest. Their defiance seems to have rubbed off on the city's most famous export, although Vidic himself is keen to play down his wartime experiences. 'I was young and couldn't understand the reasons for the war at the time,' he said. 'It's not something I like to dwell on now because they are not good memories and the world has moved on. 'But I lived through the war and, of course, times were very difficult. At Uzice, as a junior footballer, we had to train on the athletics track behind the stadium, not on the pitch, and often we'd wait until the planes had come and dropped their bombs before we came out. 'That was the worst moment, hearing the planes and knowing that they were coming to bomb the city. 'Then when I moved to Red Star at the age of 15, Belgrade was a dangerous place to be. 'I think this is why I see it as important that I am now a good ambassador for my country. Maybe English footballers do not have the same role, but for me Serbia's sports stars have a duty to show ourselves and our country in a good light. It was when at Red Star that Vidic suffered more personal trauma when his best friend and team-mate, Vladimir Dimitrijevic, died on the pitch after a heart attack. 'It will stay with me forever,' said Vidic. 'We were inseparable. We shared the same dreams and wanted to be successful together. We both came from Uzice and we both moved to Red Star. One way of doing this is to help out at the Vladimir Dimitrijevic football school recently opened back in Uzice and headed by his best friend's father. 'I will go there after the end of this season to meet the kids and help in any way I can,' Vidic promises. 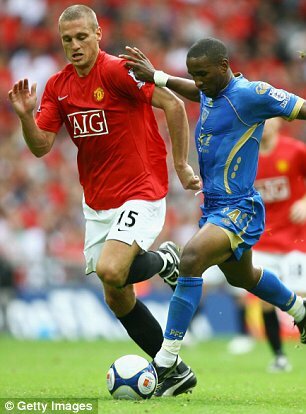 In his friend's absence, Vidic went on to become Red Star's captain at the age of 22, leading them to a domestic league and cup double in 2004. 'Of course, I know just how big a club Manchester United is in the world, but in Serbia Red Star is king and everyone knows you and has an opinion about you,' he said. 'When you play for Red Star, there is nowhere you can go in Serbia where people are not talking about you and Red Star. Not that Vidic found settling in the north-west was without its problems. Shortly after his arrival at United in January 2006, he suffered such doubt that he became convinced he had made the wrong move. Now, with his reputation growing and his home life with wife Ana and their son Luka settled, Vidic is candid about his feelings. 'I found it hard to settle in Manchester and at United,' he admitted. 'When I moved to Moscow it was easy because there were five Serbs in the Spartak team, but at United there was nobody. In Manchester people didn't know much about me. 'I know everyone was asking whether I was good enough to play for United. I felt as if I had to show something always, in training and in matches. Sir Alex Ferguson begged to differ, though. 'I was very down for a while but the manager kept telling me he believed in me and that I'd come good and be a big player,' said Vidic. 'That really gave me confidence, and when my partnership with Rio Ferdinand started to work, I began to show what I can do. So will they help United to a successful defence of the title? Vidic is hopeful. 'Right now, it is like a track and field race,' he said. 'The two leaders, Liverpool and Chelsea, are at the front of the race with one lap to go. We are sitting just behind them, on their shoulders, looking nice and comfortable and ready to choose the moment to strike for the finish line.